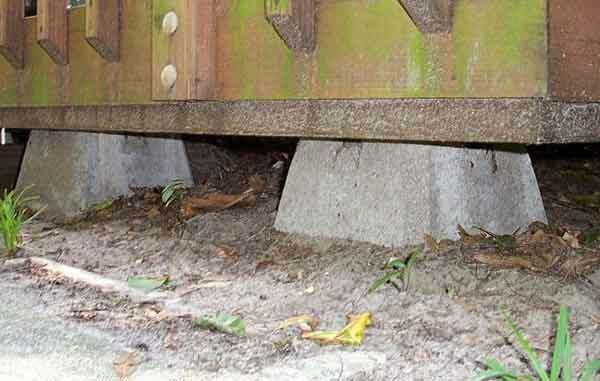 1) Opossums were living under this wood deck. After I captured and removed them, the customer wanted an exclusion barrier in order to ensure that no more animals chose to make this space their home. 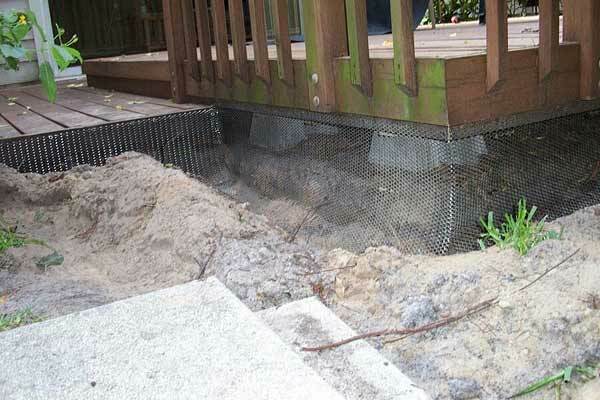 2) I dig a trench around the entire perimeter of the deck and install strong steel mesh deep into the ground. 3) I refill the trench with dirt and pack it down. No animals can get under the deck now. If they try to dig, they won't get past my system. I curve the steel mesh out, ensuring that animals can't dig under it. 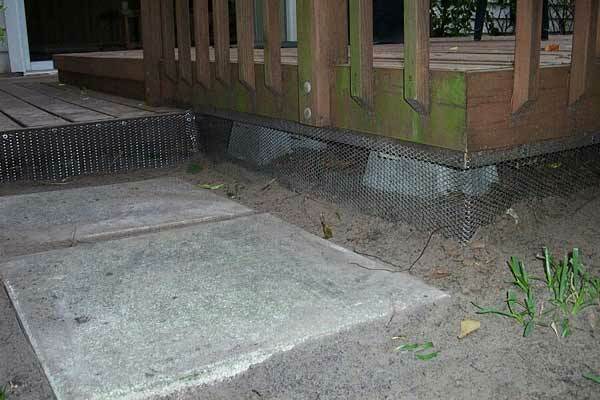 Exclusion barrier around a deck - You can keep animals such as raccoons, opossums, snakes, and more out with the use of an exclusion barrier; however, you need to maintain the barricade to make sure no gaps have opened up near the base. Some animals can dig under barriers, and a snake does not need much room to get under a barrier, especially if the barrier is made out of temporary materials. The best snake barrier will be made out of something smooth and solid. 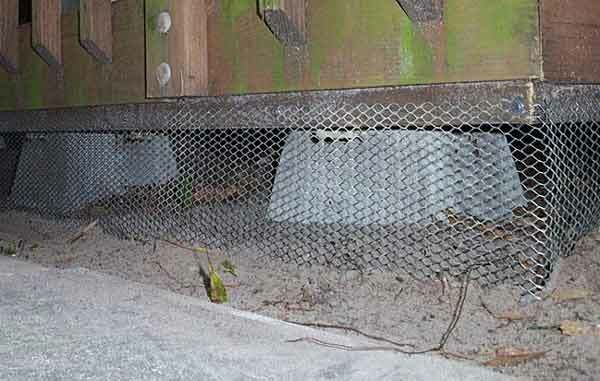 Wire mesh is an inexpensive alternative, but it is often malleable and can still let small snakes inside. It may be possible to find a mesh with small enough openings; however, if home aesthetics is important to you or your neighbors you will want to find a way to creatively cover the wire. It is also considered practical to bury the exclusion barrier a few inches into the ground. Snakes can easily slip under many forms of fencing. If the barricade is far enough into the soil, you won?t have to worry about the snakes finding a way beneath it. If you go down a foot or more, and bend the bottom out, then digging critters won't be able to get in at all. Keep in mind that wildlife and snakes can be excluded from your property in less-evasive ways. 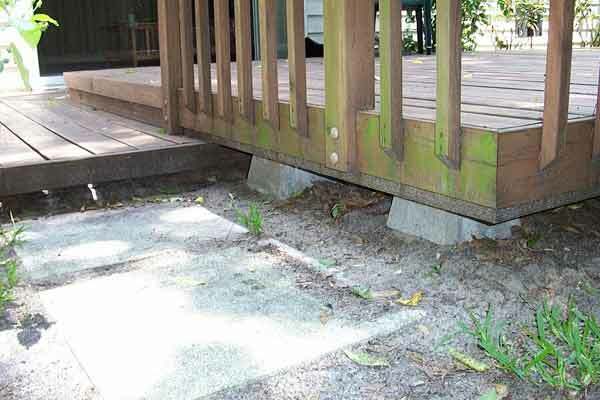 By keeping the grass and vegetation around your property and deck cut short, you eliminate the cover that snakes need to feel secure. AAAnimal Control is a professional nuisance wildlife control company. Services include animal trapping, capture & removal, plus animal damage repairs and preventative measures. We also offer biological cleanup and many other pest control services. You can always browse this site for more details and info, and you can even check out prices ahead of time. If you need a local trapper in your area, click here for a nationwide list of 100's of professional wildlife control experts.